Whether we like it or not, life’s all about first impressions. The bad thing about them is that they’re easily wrong. The great thing on the other hand is that if they come out just right, it can be the first step to having a client for life. That being said, it’s much harder to turn a bad impression around than to maintain a positive one, and with this statement I’m getting to the point I’d like to make today. Look at your office (provided you have one). Think about what you see, and tell me how you think people feel when they come in. Is the space cozy? Is it reserved? Is it filled with personal items? Is it cramped and dark, or spacious and filled with light? Do you care about the atmosphere it provides, or are you focused entirely on the quality of your work instead of how pretty your office is? Truth be told, the way your office resonates with your clientele is not to be disregarded. When it comes to making people feel comfortable, building trust and establishing connection with respect to their needs, there are no second chances. Especially not in the fast-paced online world of today. If you think a website is just some sort of a business card with your contact info and description of expertise, you couldn’t be more wrong. Young people looking for any kind of service (from kitchen utilities and sports equipment to mortgages) have very high standards, and just putting your name on a webpage and listing your achievements won’t impress anyone. 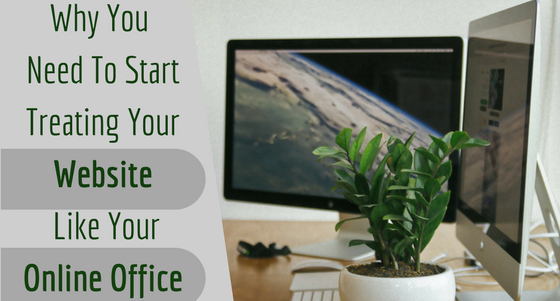 Your website is like your office. Except it has much more traffic than your actual office, and it has the potential to generate even more if you do it right. People (and the younger generations especially) care about design. Just take a look at all the big players spending thousands of dollars these days on re-design and re-branding of their branch offices, or start-ups winning competitions for the coolest and most stylish offices in the world. Let it be a lesson, and when thinking about your own website, bear in mind that colors, shapes and feelings often matter more than walls of text (no matter how relevant). Web design is no longer about bright colors and big headlines; it’s more about building around a simple, central thought and communicating it clearly and consistently, with every element. If you’re the mortgage professional I take you for, the way you talk to your clients is extremely important to you. You want to create the impression of outspokenness, erudition and control over your field of expertise. Exactly how it should be; except that many clients won’t ever get to witness it because they will roll their eyes at the copy on your website and click away. Writing is for many people much more of a challenge than speaking. I personally know strikingly smart and impressive people who I don’t even recognize in their terrible written communication. Be honest with yourself and revise your copy. Your website shows who you are and what the client can expect. But they also didn’t come there to be bored to death by your bio or waste time with irrelevant, self-selling nonsense. Find balance between a matter-of-fact and storytelling approach. Add a dash of personality to everything you write. And if you’re lost, hire a copywriter. If your website feels as messy and puzzling as your office, no wonder you’re not getting any calls. People simply left before even trying to find the contact section (the sole fact that they had to try to find it is a big minus point). The site map needs to be as clear as the summer sky. Having to search for something through more than one click is not an option, especially not for people who are looking at your page on-the go, on a mobile device. Adding an ever-present, chat-like “Contact me” window, on the contrary, is a great idea. Your personal presence is important on every page, so make every step feel like you’re right there with them and easy to reach. If your aim is to attract young homebuyers, simply having a website is far from enough. Young people live their lives online, and when they come to you they need to feel right at home. Besides, it takes a while to set up a personal meeting, so make sure your online presence is as trustworthy, professional and genuine as the real one.